Friday’s gains seemed to have been a tipping point for major US indices as almost half (six) are now in uptrends. At the same time, conditions have become pretty overbought as only two are trading in neutral territory. Not only are twelve of the ETFs overbought, but they are also approaching extreme levels. Only the large-cap Dow (DIA) and S&P 100 (OEF) saw gains of less than 2% last week. Glancing at the charts, there are two noticeable patterns between large caps and the others. In spite of some stalling recently, large caps have made a push into the range from 2018 highs and highs from the Q4 sell-off. For the likes of the Dow (DIA), Russell 1000 (IWB), and the S&P 500 (IVV, SPY, VOO) those 2018 highs will be the next resistance to be watched. 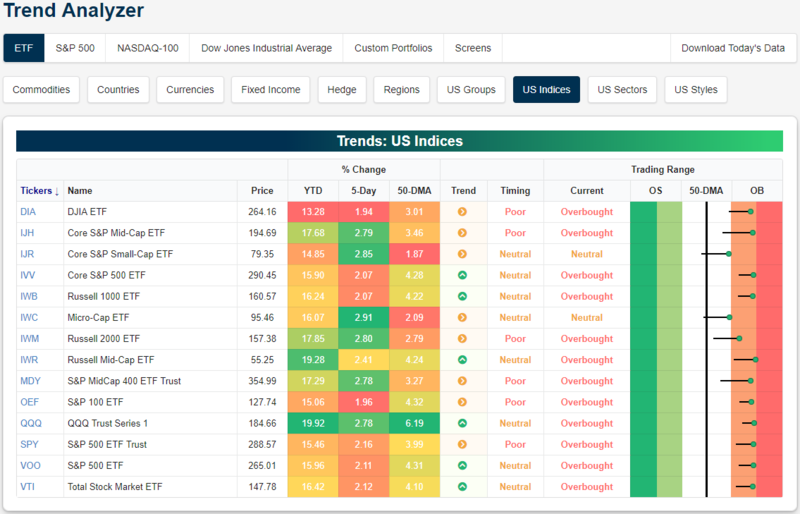 Unlike large caps, small and mid caps have recently made lower lows and lower highs, but late last week’s trading helped to bring the ETFs out of these short term downtrends.